Earlier this month, the U.S. House voted to reset the clock, to return to a time when policies helped people and where regulations were not used to pursue ideological aims. We did this with the passage of joint resolutions of disapproval under the Congressional Review Act (CRA) on two regulations related to domestic energy development: The Office of Surface Mining Reclamation and Enforcement’s (OSM) stream protection rule and the Bureau of Land Management’s (BLM) venting and flaring rule. The Senate followed suit sending the stream protection rule to the President’s desk. Now it’s time to follow through with the venting and flaring rule. The CRA was designed to ensure accountability. The power to make laws lies with Congress in Article I of the U.S. Constitution, not the ever-expanding federal bureaucracy. During the past eight years, the Obama administration pulled out every stop to block energy and resource development on federal lands under the guise of environmental protection. America’s Western states bore the brunt of a relentless campaign of unilateral, overreaching rules, orders and memorandums systematically designed to make these activities uneconomical. In the West, we depend on our lands for our economic livelihood. In fact, these resources, much of which is located on federal lands, are critical – they fund infrastructure and pay for schools and other basic public services. In my home state of Utah, the federal government owns two out of every three acres. After the Obama administration failed to pass cap-and-trade legislation under a unified Democratic government in 2010, the White House began its work to sidestep Congress. Both the Environmental Protection Agency (EPA) and the Department of the Interior would become central pillars in this effort. There was only one problem: The administration lacked statutory authority for most of the actions they were proposing. But this didn’t deter them. In January 2015, the White House announced that BLM would begin regulating emissions. But the bureau, the nation’s principal land management agency, is mandated by statute to facilitate oil and gas development on federal and tribal lands—not air quality. The authority to regulate air quality is vested with the EPA in partnership with states. The venting and flaring rule seeks to further regulate methane releases from oil and gas development on federal and tribal lands through a range of stringent planning requirements, development prohibitions and potential royalty rate increases. Again, it comes on top of an EPA rule that does the very same thing, and pre-existing state regulations. Needless to say, BLM’s duplicative policy was immediately repudiated by states, tribes and communities across the country. The other problem for the Obama White House was that oil and gas production was surging, lifting state economies across the country from economic downfall. At the same time, methane emissions were nose-diving nationally due to industry innovation—and without the heavy hand of federal intrusion. Repealing the venting and flaring rule under the CRA offers members of the Senate the opportunity to make good on our fundamental constitutional obligation. This action also protects people. We will save thousands of jobs that are supported by America’s domestic energy industry, including independent energy producers—the small, family-run businesses that are most heavily impacted by this oppressive rule. We will also save vital streams of revenue for federal, state, and local governments that are used to support schools, infrastructure and other important services. Finally, putting a stop to this rule is an acknowledgement that federal policies should support rather than stymie innovation for an industry that has provided new economic fortune and opportunity to so many hardworking American families. President Trump can sign the resolution of disapproval and instantaneously make it as though the rule never existed in the first place – if the Senate acts. Doing so will be a positive step to rein in the unelected federal bureaucracy and to begin promoting a stronger American economy through the responsible development of our domestic resources. U.S. Rep. 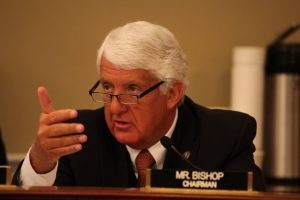 Rob Bishop (R-Utah) is the chairman of the U.S. House Natural Resources Committee and the author of the House resolution of disapproval against BLM’s venting and flaring rule.